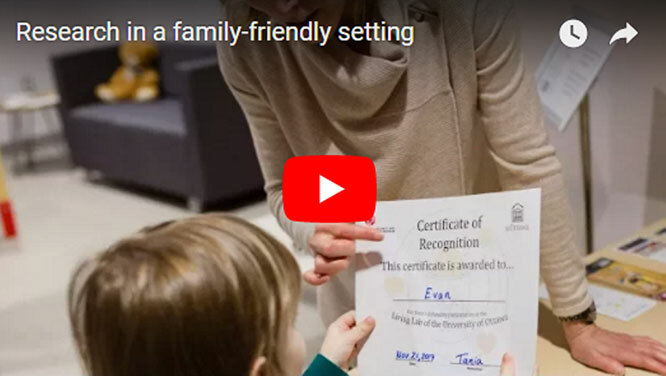 University of Ottawa developmental psychologists and linguists are now conducting groundbreaking research in a child-friendly museum setting. While children participate in studies about how language and cognition develop from infancy to school age, their parents gain some fascinating new insights. 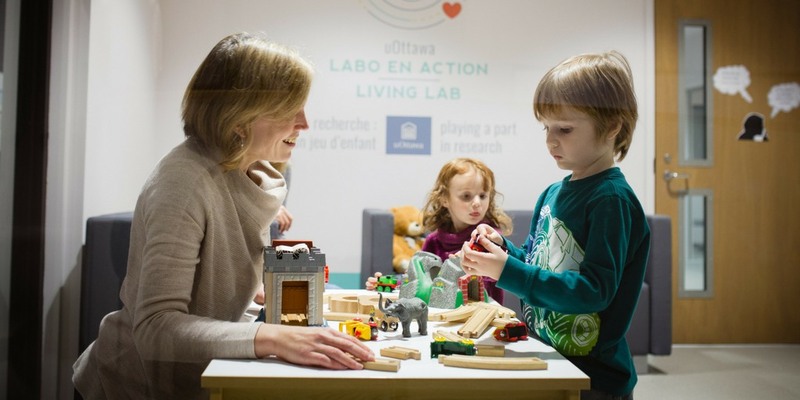 These studies take place at a brand-new, state-of-the-art installation called the uOttawa Living Lab, located within the newly renovated Canada Science and Technology Museum. The lab, which opened to the public on November 17, is connected to the museum’s new children’s gallery. Families visiting the gallery simply walk in and interact with researchers, who engage them in short games, puzzles or problem-solving tasks. The greeting room consists of a large glassed area where cool facts about child development are presented on a large flat screen. 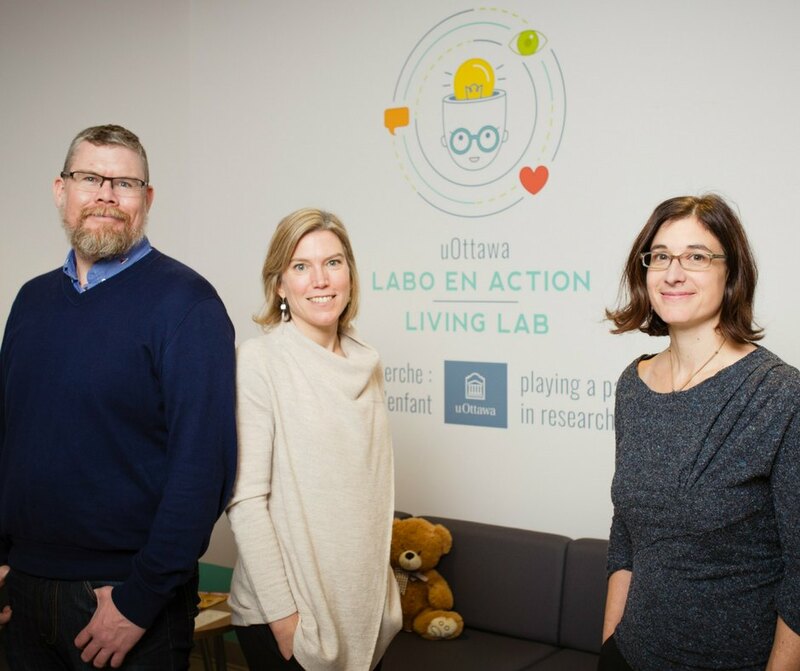 This space leads to three testing rooms where uOttawa professors pursue their research with the help of senior undergraduates, graduate students and postdoctoral fellows. A parent waiting area and a full data analysis room also form part of the new facility. This is the largest living lab in North America and only the second in Canada, after the University of British Columbia’s Living Lab at Vancouver’s Science World. “Our lab is an integral part of the museum, and the space is massive,” said developmental psychologist Chris Fennell, one of three professors conducting research in the facility. Why conduct research in a museum? Carrying out research in a museum is a relatively new idea. It started in 2005, when child development researchers at Harvard University and MIT began collaborating with the Museum of Science in Boston to undertake studies on cognitive development. The living lab model is ideal for quick research projects because they can be conducted in a public setting with people who are already interested in science. The researchers can, for example, hand iPads to parents to fill out online surveys. The result: valuable research data collected during short interactions with parents that don’t take much time away from their museum experience. “In one of my studies, parents are asked about their use of mobile media and about their child’s language development, so we are able to look at the relationship between the two,” Professor Fennell says. His colleague, Professor Tania Zamuner, studies word recognition by using an eye-tracking device that follows where a child looks on a flat screen after hearing the name of an object. Professor Cristina Atance, another researcher at the lab, uses game-like tasks with children to better understand how their memory and thinking about the future develop. All three professors are co-directors of the Living Lab and, in addition to their research, they have been busy setting up the space. As it becomes more established, they will invite other professors to conduct their own studies there. Before the opening of the new lab, the researchers were engaged in a two-year pilot project at the Canada Aviation and Space Museum. They were able to test how the permanent installations would work and fine-tune the studies that could easily be conducted in a museum setting.